At the beginning of the week, I had all intentions of joining my sweet hubby at church this morning. Life however, had other plans for me. As the week began I felt okay, by Wednesday I was racked by fever, congestion, and a nasty cough. That has decided to hang around and hang on till I see the doctor tomorrow, I suppose. When my feet hit the cool hardwood floors this morning. A conversation that I had had earlier in the week with a sweet friend replayed over and over in my mind. I had laughed the conversation of to begin with. For the simple reason a Pastors home already draws so much attention. It really did not need more. However the conversation still sang in my ears and God whispered do it. You see we are both pastors wives. I promise our lives are not glamorous. Yet the there is never ever a dull moment. We were texting last week and she said I think you should do a blog on living in the parsonage. I brushed the thought off and said I may would have to do it anonymous. Still in the quite of my home with only the soft hum of the fridge and traffic in the back ground. God spoke to heart and said that there is lots to share and be learned from this perspective. So here we are, I would like to give the pastors family point of view of living from the parsonage. I hope this encourages pastors wives and this opens the eyes of others who stop by to the glass world we live in. I hope this helps new Pastors wives who are just now beginning new ministry adventures that often lead to moving away from home, that it does get easier and God will never leave you! So here we go I Hope that I can blog on a new topic each week that encourages you! If you have a question feel free to leave it in the comments I would love to help if I can! So here goes nothing ! I hope you enjoy my first entry! You Want Me to Go Where ? I will never forget the morning the phone rang and my husband answered and intently answered the questions he was presented with! We had just resigned a church plant of 5 years we had started from the ground up. As hard as it was we knew our time there was done and God was leading us to somewhere new. We had no idea where yet. Just two weeks before this phone call we were having lunch at a local pizzeria. I laughed and told my sweet husband I thought God was gonna call us to the mountains and any one who knew me this was a big deal. I grew up in West Virginia and had no desire to live the mountain life again. Yet that day it seemed okay. That phone call would be the beginning of a seven year adventure that would forever change our family of four. When my hubby hung the phone up. The look on his face said it all. It was a small church in the mountains of North Carolina and they were in search of a Pastor and one of our dear friends had given them our info. The idea of visiting was exciting. My girls were even excited to take the little adventure. However none of us girls were prepared for what laid ahead. I will never ever forget our first visit, the small town, if you would have blinked you would have literally missed it. When we turned on the winding road that led to the church, my heart instantly knew it was in for a change that would forever change me. The people were warm and kind and couldn't wait to show us to parsonage where we would be staying the next few nights. the shock we soon encountered when we asked where the local Walmart was will forever be ingrained in my mind lol. It was 30 minutes away one way and that was literally all there was. and told us the Lord had called us to minster in Newland NC. I was excited but overwhelmed at the same time. We had two weeks to pack up our home, tell our family and friends good bye, and prepare our hearts for what was to come. Its never easy for a pastors family to go into a new work. Now don't take me wrong our hearts are ready to go in and do all we can for Jesus. However we are saying good bye to all we know. So we can come in and minister and lead the flock God has called us too. We often come into these places with kids who are upset because they left behind their friends, We personally don't know anyone at all on a personal level. We have a new home to put together and ministry responsibilities that begin the moment we take on a Pastorship. I never had a mentor in the ministry.... I wish I had lol... I think she could have saved me a lot of heartache lol. So If your visiting today and Your hubby tells you God is calling you to move away from all you have ever known. I want to encourage you! Take a deep breathe ! Its gonna be okay. I know the congregation is very excited to have you! They want to visit and make you feel welcome. Those things are so important, however your sanity is even more important. Ask if for the first week they would please just give your family sometime to get unpacked and settled in! Have a meet and greet in the fellowship hall of your church after service so everyone has a chance to meet your family. This keeps you from being bombarded in your home the first week. Be sure to assure your congregation you cant wait to receive visits after the first week. Set the kids bedrooms up first. Make sure you pack a box with all the their favorites that can be easily found as soon as you arrive. The next most important room is the kitchen! Take it from someone who learned the hard way. Don't allow family to visit to soon. Give yourself time to settle in so homesickness doesn't plaque you before you can catch your breathe. Make the parsonage your home. Make it feel as if its your own home. Besides it is until further notice. Remember just because your a Pastors family you are still human and you will miss home. It doesn't mean your not a Godly person for it. It means your human. Hang in there it will get better ! Homesickness is one of the worst sicknesses their is. Its bound to happen. Limit phone calls and face times for a time so your family can settle in and become its own strong family unit. That away when homesickness comes a knocking your better equipped for it! I promise you it will. You will feel like your missing out on everything! Just know your not the reward of the time with your own family unit will strengthen you beyond words. You will be glad for how close and strong your family inside your walls will become ! It will be life changing! I hope this has helped someone out there! hope you will come back next week ! I am praying for your families this week! 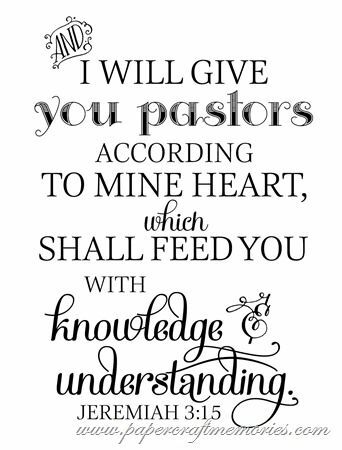 If you have a Pastor your thankful for! Please make sure you tell him so. I know I am beyond thankful for mine ! Written with a gentle heart, loved it. Pastor's wives are always on the shelf and being gazed upon more so than the pastor. That was great advice. I pray it will help a pastors wife some where. love ya sis. Eeek! I'm so excited to see this post! And I hope its the beginning of many, many, many posts :) You have no idea how grateful I am for you! You will never realize the impact you've had on my life, and how thankful I am for the many, many many times I've laid my heart and mind at your feet and you've encouraged me to move forward. I'm beyond thankful that God put you in my life before he set us out on this ministry journey! Your words have always been a blessing to me! I hope this is a 'series' of stories that you will be willing to share! Thank you, for being open and honest, and everything you've told me has proven to be true in our settling into ministry as well! Love you so very much!